The snow has caused travel chaos. As the North East is in the grip of the Beast from the East, with blizzards and bitterly-cold weather, keep up-to-date with the latest weather alerts and news. Friday, March 2 (10.45pm): Mountain Rescue crews respond to more than 40 incidents in 60 hours. Click here for full story. Friday, March 2 (8.30pm): A planned coffee morning and raffle to raise money to help specialist dementia nurses support families has fallen victim to the weather. The event was to be held tomorrow at 11am in Ellingham Village Hall. It is hoped to rearrange it in the coming weeks. Friday, March 2 (8.10pm): Northumbria Police road-closure update for Northumberland – A1 Denwick to Scremerston, closed both directions; A68 Styford to Carterbar, closed both directions; A696 Knowesgate crossroads to A68, closed both directions. Friday, March 2 (8.05pm): Alnwick Town’s match with Easington Colliery tomorrow has been postponed. Alnwick Town has also postponed its open meeting on Sunday and a new date will be arranged. Friday, March 2 (7.25pm): Tomorrow’s Druridge Bay parkrun has been cancelled. However, the course for the Newbiggin parkrun is clear and at the moment the run is on, subject to a final course inspection at 7.30am tomorrow, ahead of the 9am start. Friday, March 2 (7.15pm): Northumberland County Council has issued a roads clearance update, including when it is likely to start clearing more rural areas of the county. Click here for more details. Friday, March 2 (6.15pm): Message from Northumbria Police – ‘The A1 remains closed between Denwick and Scremerston. It may appear as though some areas of the A1 are improving, however there are sections that still require clearing and are impassable. We are currently working with the Highways Agency to clear as many roads as possible. We will inform the public when this road is clear. Please do not travel on these roads until advised, otherwise they are dangerous. Friday, March 2 (5.25pm): The Shields Ferry is suspended due to the bad weather. Friday, March 2 (4.15pm): Network Rail teams work to clear the East Coast main line between Berwick and Fenham. Friday, March 2 (3.10pm): The Sill will be closed this weekend following advice from the Met Office and its ranger team. Friday, March 2 (3pm): Traffic update from Northumbria Police - A1 Southbound, south of Alnwick near Whittingham. The vehicle on its roof has been recovered and the carriageway has reopened southbound from Alnwick. Please drive carefully and to the conditions. Any traffic build up will be clearing but be patient. Friday, March 2 (2.20pm): The A697 is now passable with care. Friday, March 2 (2.15pm): Coach passengers who spent the night at the Swan Centre in Berwick, after being stranded on the A1 for six hours, are on their way home at last, in a police-led convoy. Visit our Facebook page for interviews and the latest live feeds. Friday, March 2 (1.45pm): Stranded motorists spent the night at sports centre in Alnwick and Berwick. Full story here. Friday, March 2 (1.25pm): Northumbria Police rural Northumberland team tweeted: Can all drivers please take note of diversion signs that are currently in place due to road closures. Please also follow the advice provided by local police officers. Friday, March 2 (1.25pm): Police roads update: A698 - closed no access from Berwick to A697; A1 Alnwick to Morpeth down to one lane in places with snow drifts; A1068 no reported issues; B6342 is impassable; B6341 Rothbury to A697 is closed; A1 S/B at Whittingam - closed due to an accident. Friday, March 2 (1.20pm): Northumberland County Council plans to carry out precautionary gritting on all routes from 6pm and again at 4am on Saturday. Drivers are reminded to only make journeys that are absolutely necessary. Snow showers continuing to feed in on a cold east to southeast wind through this afternoon, this fresh to strong, with temperatures again struggling to rise above freezing. The risk of further snow showers through this evening and overnight with limited clearer breaks. It will become very cold once more with ice likely. Remaining rather windy. Friday, March 2 (1.15pm): Alnwick bus station has now been cleared of snow thanks to Northumberland County Council. Friday, March 2 (1.05pm): Northumbria Police reiterate the A1 is closed between Alnwick and Berwick. Convoys in place to move vehicles on road. Friday, March 2 (1pm): Northumberland Wildlife Trust to keep its Hauxley reserve closed until Tuesday. Friday, March 2 (noon): Virgin Trains East Coast says customers travelling to or from Newcastle from February 28 to March 4, can claim a full refund. Customers who have deferred their travel may travel up to March 7. Anyone who wants to defer their travel past that date is asked to refund their original tickets and buy a new one. Friday, March 2 (11.56am): The Northumberland National Park Mountain Rescue Team and the North of Tyne Mountain Rescue Team are called to rescue two van drivers stranded for 24 hours on the moors above Redesmouth. See embedded Tweet for pictures. Friday, March 2 (11.30am): The Swan Centre in Tweedmouth is hoping to be able to get those who took shelter there over the last day away out on their journeys again, reports Coun Karin Graham of Berwick Town Council. Friday, March 2 (11.20am): A696 north of Ponteland is closed due to deep snow drifts which can not be cleared. Northumbria Police says the area of Otterburn can not be accessed at this time and likely to be closed for some time yet. Friday, March 2 (11.10am): Northumbria Police says the A697, from the A1 to past Heighley Gate, through New Moor Cross Roads B6341, is passable with care. The A697 from New Moor Cross to Wooler is currently relatively clear. There is some snow on the carriageways but it is passable with care. Friday, March 2 (10.45am): Arriva North East has tweeted that as the A69 has re-opened, through services between Newcastle and Carlisle will resume from the 10.45am departure from Newcastle and the 11.15am departure from Carlisle. Friday, March 2 (10.40am): Borders Buses has resumed a limited bus service in Berwick. Friday, March 2 (10.31am): Holy Island Coastguard says the causeway remains blocked with snow and sea ice. Some areas on the island are still 6ft deep in snow. Friday, March 2 (10.30am): Some messages posted on Twitter about closures throughout the county - Wallington Hall: Due to the ongoing adverse weather, we will be closed today, tomorrow and Sunday (2-4 March). We are hoping to reopen on Monday 5 March but please keep an eye out for updates on our social media and website. The Sill: National Landscape Discovery Centre will be closed today (Friday). We will advise on potential weekend opening as soon as we can. Alnwick Treehouse: The Treehouse won’t be open today. The beast continues to disrupt our dining. Friday, March 2 (10.20am): Letham Shank weather station in Berwick is recording a wind chill of -7C at the moment. Friday, March 2 (10am): Northumbria Police reports there are still a number of road closures in place, including the A1 northbound between Alnwick and Berwick. Drivers are asked to avoid this area if possible. Friday, March 2 (9.40am): The Lindisfarne Inn at Beal put up around 50 stranded travellers overnight. Friday, March 2 (9.15am): Please be aware that both routes out of Eshott are blocked with significant snow drifts and are impassable to all vehicles. Friday, March 2 (9.15am): Berwick residents have shown their spirit and kindness to help people stranded on the A1. The Swan Centre was open overnight to provide shelter, while The Castle Hotel and Brewers Arms also helped out. Friday, March 2 (9.10am): Household Waste Recovery Centres in Northumberland are closed today. Efforts are being made to open sites tomorrow. Friday, March 2 (8.15am): The A696 in Northumberland is not passable – please avoid. Friday, March 2 (8.10am): Northumberland County Council gritters have continued working overnight with support from farming and other sub-contractors in challenging conditions. Further snow showers and high winds and drifting snow have made driving conditions treacherous county wide. Abandoned cars are still causing issues with ploughing on some roads across the county. The county council will continue to work 24 hours throughout this weather. Do not travel unless absolutely necessary. Friday, March 2 (8.05am): PCL Travel have cancelled service 15 (Alnwick to Rothbury); service 470 (Wooler to Alnwick); service 473 (Wooler to Alnwick). Friday, March 2 (8am): Northumberland County Council has this morning updated the list of schools which are closed today. Is yours on the list? Friday, March 2 (7.30am): Northumberland County Council update – Driving conditions across the network are still hazardous. Drivers should only travel if absolutely necessary. If you do need to travel be prepared for delays across the area. We have road closures across the county including the A68 north of Corbridge. 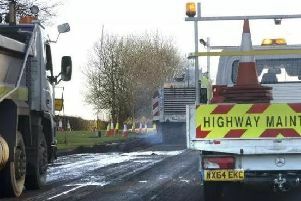 Friday, March 2 (7.20am): A68 Traffic Update – reports received that the A68 north of the junction for Healey at Kiln Pit Hill is down to one lane with snow blowing in from the fields. Not passable in anything other than a 4x4. Avoid the area if possible and only travel if absolutely necessary. Friday, March 2 (7.15am): A1 from Alnwick to Berwick still remains closed to vehicles. The A1 is still impassable in this area. Police and Highways staff are trying to safely move stranded vehicles in convoy.